The last thing you’ll ever hear me say is that I’ll never let my kids use technology. Part of their world will always be tied to it. However, I don’t want them to become overstimulated and addicted. 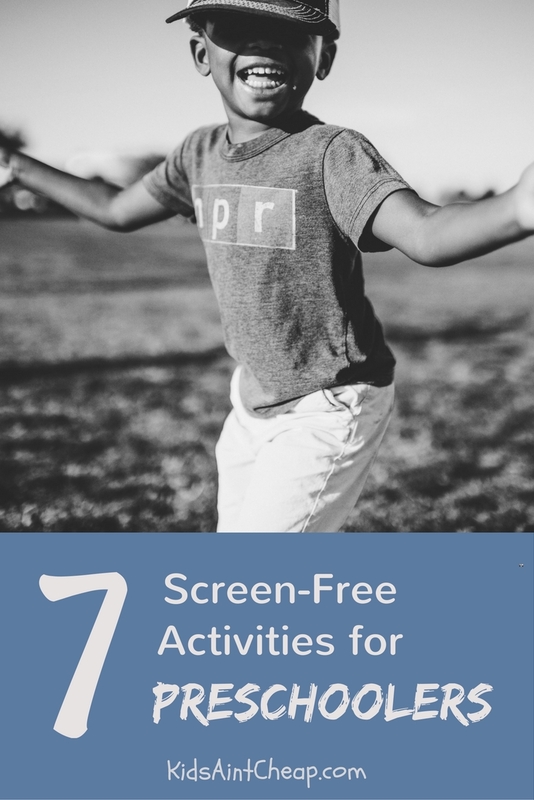 To put up healthy boundaries, here are several screen-free activities for preschoolers – since both of my children are that age. These activities have worked in my family. Now it’s my turn to hand them over to you. I notice subtle changes in my children’s behavior when they’re in front of a screen for too long. After doing some research, I now understand better what those changes are. Or more importantly, what they could become. Preschoolers don’t reflect the more serious side effects of too much technology, but the average child eight years and older is spending 8 to 11 hours per day looking at a screen, according to the NY Times. What suffers as a result? Emotional connect. Reasoning skills. Coping mechanisms. The ability to process thoughts, anxieties, and problems. All those developmental skills are under attack when screens dominate a child’s day, according to this report from NPR. The earlier we create boundaries for our children’s time with technology, the better their transition into adulthood will be. The more that you read, the more things you will know. The more that you learn, the more places you’ll go. ― Dr. Seuss, I Can Read With My Eyes Shut! Establishing a daily reading habit with your child is a great way to advance his development away from screens. To change things up, try attending a reading time at your local library or purchase some nonfiction books (i.e. a picture dictionary or a book all about what your child loves most). We keep a basket in between the children’s car seats so they can pick out a book to read on their own while I drive. One my kids’ favorite activities is listening to audio books. We pull up “reading chairs” so they know it’s time to sit and listen (you could also cut out cardboard circles with their names on them or set out folded blankets). The library offers lots of variety when it comes to audio stories for kids. Turn the pages for the children until they get the hang of it and can follow along by themselves. This activity promotes sitting still, listening, learning by spoken word, and early reading along. Make believe a favorite character. During an episode of Daniel Tiger’s Neighborhood, my children watched the characters try on several different costumes and parade around the play room. Once we shut the TV off, my kids instantly wanted to be like those characters, so we grabbed some play clothes and made it happen. This activity helps kids develop their imagination, and helps them understand that not all fun happens on the other side of a screen. Screen-free activities for toddlers especially come in handy in the car. Have a basket of mess-free crafts, book or toys can help them learn to occupy themselves without DVDs or iPads. book. These last a long time, help your children learn hand-eye coordination, and never leave a mess behind. Whether it’s a fort made from couch cushions or a castle made from LEGOs, building something is immensely beneficial to your preschooler. It’s like you can see the smoke rising from the wheels turning in their brain as they problem solve each piece of the puzzle or tower. It’s an 80-piece set of easy-to-use building blocks that can be added to over time and at any age. Staying active is next to impossible while a child is hooked up to a screen. Just like you can create a reading time every day, try to take the kids outside each day. You can take them to the park, for a walk, to the zoo, the pool, on a field trip, or just out to the driveway with some sidewalk chalk.
. Over the last year, we’ve looked at it together and studied the numerous intricacies of our world. Yes, you can download Google Earth for free, but studying a 3D globe in a group is different. The children can feel the earth. They feel the mountain ranges, spin the planet on its axis, and wrap their arms around its round shape. Being able to study that together creates a discussion format that wouldn’t likely happen through an app. For more ways to keep your kids busy without putting them in front of a screen check out these articles. 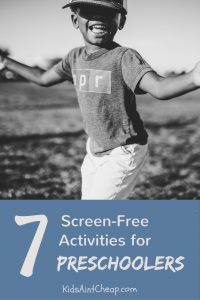 What screen-free activities for preschoolers does your family enjoy?